Material: PU Leather, Sponge, Cloth, Polish. Item Type: Shoe Care Kit. style: Shoe Care Kit. 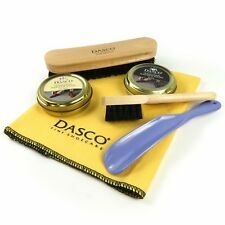 Dasco Full Shoe Care Kit. The kit contains 1 neutral and 1 black shoe polish, 1 applicator brush,1 shoe shine brush, polishing cloth & shoehorn. The shoe polish has a gloss finish which is waterproof and nourishes the shoe. Fashion & Footwear > Bags & Accessories > Shoe Care Kits. Type: Shoe Polish/ Cleaners. A signature may be required on receipt. Ideal for School. Change of mind. Buy Now Price. Shoes Care. Add To Favourites. Brown Brogue Faux Leather case. Luxury silk ties by Thomas Pink, Charles Tyrwhitt, T.M.Lewin, Paul Smith, Ted Baker, Duchamp and others . Paul Smith & Ted Baker button lapel pins and tie tacks. Ted Baker Mother of Pearl button cufflinks. Zip fastening. Includes: A tin of neutral & black shoe polish, application Brush, two buffing brushes, a hand shoe horn and a soft cleaning cloth. Shoe Cleaning Kit - (7 piece Kit). Ideal handy travel sized shoe shine kit. 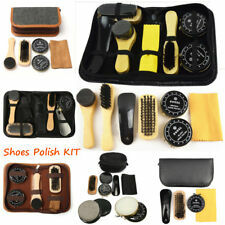 8 in 1 Black Neutral Shoe Shine Polish Cleaning Brushes Set Kit Travel Case NEW! The zip up travel case contains: 1 neutral and 1 black shoe polish, 2 shoe brushes, polishing cloth, foldable shoe horn with lint brush and a cleaning sponge.The shoe polish has a gloss finish which is waterproof and nourishes the shoe. Brown brogue faux leather case. Stay dapper from the toes up with Ted’s essential shoe-shine kit presented in a cool faux-leather brogue-style zipped case. Contains 2 brushes, 1 black polish, 1 neutral polish and a cleaning cloth. 2 x Shoe Brushes. 1 x Brown Shoe Polish (25ml). 1 x Black Shoe Polish (25ml). 1 x Clothes Brush. 1 x Shoe Buffer. Luxurious shoe polish kit in a smart convtravel case. - 1 neutral and 1 black shoe polish. (although picture shows otherwise). The zip up travel case contains - 2 shoe brushes. - Foldable shoe horn with lint brush. Black brogue faux leather case. Keep your brogues buffed and your Oxford’s shiny with help from the Voyager’s Shoe Shine Kit. Included in the leather-effect zipped case are two tins of polish, two brushes, a shoehorn and a cleaning cloth. Stay dapper from the toes up with Ted’s essential shoe-shine kit presented in a cool faux-leather teal green geo print zipped case. Contains hard bristle brush, soft bristle brush, 1 black polish, 1 neutral polish and a cleaning cloth. Included in the kit are a bristle brush with wooden handle, a duster in a seperate cover, neutral shoe polish with a seperate sponge applicator with wooden handle. Shoe Cleaning Kit. Functions: leather care, shoe polish application, upper cleaning, and shoe polishing. Shoe polish set. Black Shoe Polish 1. Colorless Shoe Polish 1. Sponge Shoe Brush 1. Shoe Cloth 1. Leather Box 1. Man'Stuff Shoe Shine Restore Kit Set Brushes Cloth Black Brown Polish Mens Gift. Dispatched with Royal Mail 2nd Class. The classic wooden cigar box, re-purposed as a natty shoe-shine kit. With these tools of a shoe-shining pro, you'll have everything you need to put your best foot forward. Buff-up with black polish and add a glossy sheen with the neutral cream. Shoe Polish x2 (Brown & Black). Clothes Brush. Luggage & Travel. Cleaning Fabric. Baby & Child. Any unauthorised use or disclosure may be unlawful. Set Contains FEATURED CATEGORIES. The kit includes 1 shoe polish brush, 1 small shoe polish brush, for those hard to reach areas, a small shoe horn, a polish cloth and Honco shoe polish in Neutral. The shoe polish has a gloss finish which is waterproof and nourishes the shoe. Black Philippi presentation gift box. That's why it's important to have the right tools along when travelling, to keep those shoes shining! The combination of leather and stainless steel renders the case an elegant look. This Mil-Tec Boot Cleaning Kit has been created for use with black leather boots and is ideal for police, security, cadets or anyone looking to maintain and polish their leather footwear to a professional standard. 1 x Black Shoe Polish Shine Guard. Black Shoe Polish Kit. 1 x Buffing Brush. 1 x Black Liquid Polish (45ml). 1 x Soft Cleaning Cloth. It would be very much appreciated. The zip up case contains: shoe brushes, polishing cloth, foldable, a lint brush and a shine sponge and shoe polisher. Stay dapper from the toes up with Ted’s essential shoe-shine kit presented in a cool faux-leather blue cadet geo print zipped case. 100% GENUINE TED BAKER PRODUCT. Ted Baker accessories collection. Fabric Content: Case: 100% polyurethane; Polish: 100% Shoe polish; Brushes: 50% wood, 50% plastic; cloth: 100% cotton; Shoe horn: 100% stainless steel. Presented in a motorbike design zipped pouch, so ideal for traveling. Set comprises of 2 brushes, cloth, shoe polishing cream neutral & black, shoe horn. SHOE CLEANING KIT. 7 piece shoe shine kit. Design PIT STOP by Jennifer Rose for the Leonardo Collection. 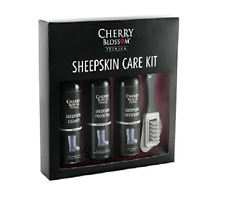 Cherry Blossom Leather Shoe Boot Care Kit. The Cherry Blossom Shoe Boot Care Kit includes everything you need to clean and protect your shoes & boots. 1 x Cherry Blossom Premium Shoe Polish (Black). This all in one shoe cleaning kit features everything you need to shine and maintain the look of your shoes. perfect for keeping your shoes perfectly polished whether at home or traveling.Great gift for Father's day, birthdays... Great for keeping your kids school shoes in tip top condition. The shoe polish has a gloss finish which is waterproof and nourishes the shoe. Weight:230gCase size:approx 18*11*5CMCase Material:LeatherPackage included:1*the zip up travel case1*neutral shoe polish1*black shoe polish1*polishing cloth (color send it by randomly)1*plastic shoe horn1*wood handle shoe sponge2*wood handle shoe brushesNote: Light shooting and different displays may cause the color of the item in the picture a little different from the real thing. The measure. Ted Baker - 5 Piece Shoe Shine Kit in Brown Brogue Faux Leather Case Stay dapper from the toes up with Ted’s essential shoe-shine kit presented in a cool faux-leather brogue-style zipped case. Brown brogue faux leather case Single zip closure with stay open top Bright blue lining Contains 2 brushes, 1 black polish, 1 neutral polish and a cleaning cloth Product code TED086.